SCVHistory.com HS2811 | Castaic Junction | Telephone Company Crew, 3 Miles West of Castaic Junction, ~1928. All we know about this photograph is what's typed on the back: "Three miles west of Castaic Junction." It's from a grouping of a couple of hundred photographs, the vast majority of which are unidentified. From the few that are identified at all, they seem to fall into two categories: (1) damage from a major winter storm off of Coronado in 1924; and (2) telephone company linemen stringing wire all over Southern California in 1928 (and possibly other years). Most of the photos show telephone poles and/or workers. By comparing the illegible insignia on the truck to other photos, we can establish that this is a telephone company crew. The location is indeed roughly three miles west of Castaic Junction; we're looking at the north side of Highway 126 between today's Wolcott Way and the entrance to the Chiquita Canyon Landfill (i.e., just before Chiquito Canyon Road at the mouth of San Martinez Canyon). See below. 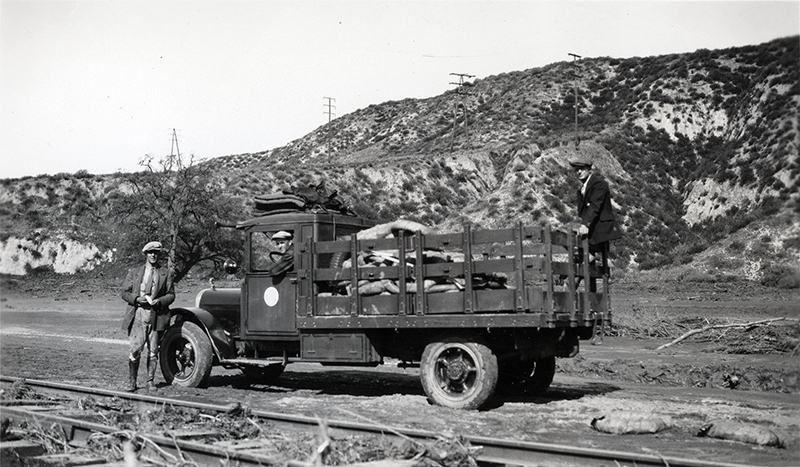 The year 1928 would fit, considering that the debris seen between the train tracks and on the far side of the truck probably relates to the St. Francis Dam Disaster of March 12-13 of that year. We don't know what's in the back of the truck; could it be salvage from the wrecked autos at nearby Kemp? Same location in 2015. Photo courtesy of Jason Brice. Click image to enlarge. HS2811: 9600 dpi jpeg from 3.5x6-inch (including white border) glossy print.